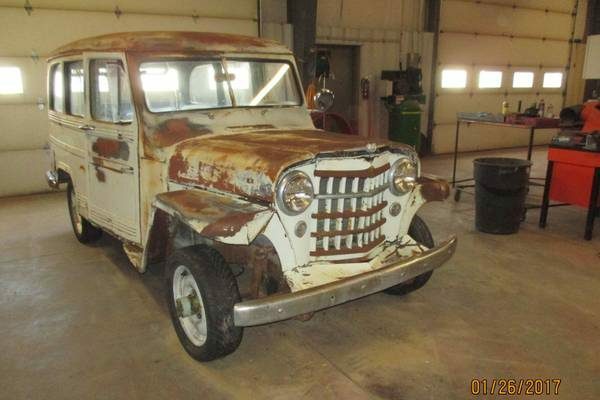 Said to have been a real Colorado barn find, this 1951 Willys Wagon will make a great 4×4 for someone. For sale here on craigslist in Denver, for an asking price of $4,560, it appears to have the bones of a good project. The ad features quite a few pictures and a fairly thorough list of positives and negatives, which is helpful. Read on to see if this may be your next project. This Willys features a flathead V8 which is said to run and not smoke. Although it’s not the original engine, a period correct flathead is a good upgrade. The biggest drawback would be if the new owner wants to do a full and correct restoration. There are a few things that will need to be addressed to make this a road-worthy project. The ad states all the glass needs replaced. The good thing is the glass appears to be flat, so it wouldn’t be too costly to replace. The ad also states the tires hold air but are not road worthy. Other than that, a check of the electrical system, fuel system and brakes should make this a fun driver. It was said to be in storage for 37 years, so it will take a bit of work to get it sorted out and reliable. The ad also states that it has a bill of sale. Not sure if that means no title, but it likely does. This may be a consideration depending on how friendly your states DMV regulations are for getting a new title. 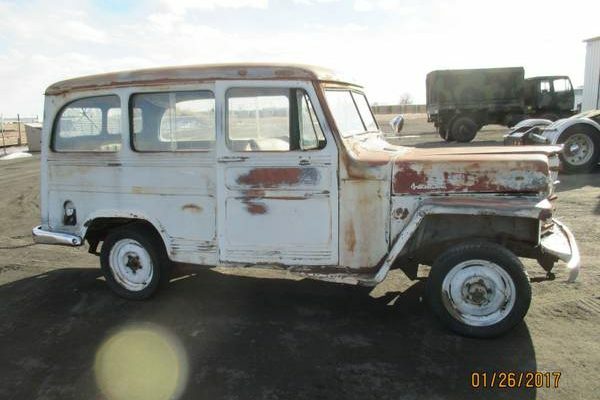 If you’ve been in the market for an old 4×4 or Willys, this project definitely has the cool factor. 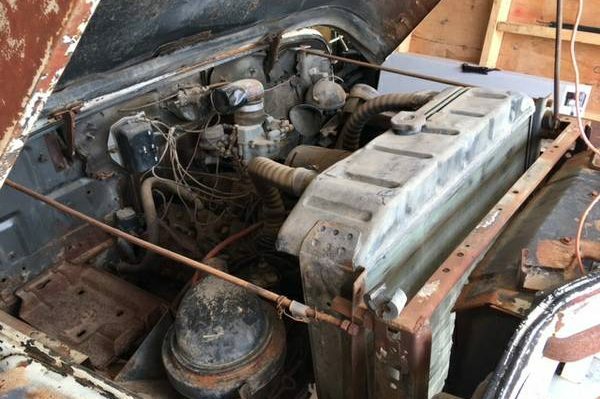 This is a fantastic find ( except it’s listed at $3,560, not $4,560) I started my “flat-fendered” Willys collection (of 2) with a 1950 like this, with a SBC ( a 2 barrel 307, I think) It retained the Willys drivetrain via an adapter plate, which I believe this has too. One could get all kinds of adapter plates for these, via you know who,,,J.C. Whitney. I’d have to think this swap was done a while back, as who would go through the trouble of a V8 swap, and use a Ford flathead? I didn’t care for the wagon early on. It was all over the road,( most Willys have sloppy steering) poor brakes, rode rough, rattled, no heat, it was actually a miserable vehicle,except for the V8. 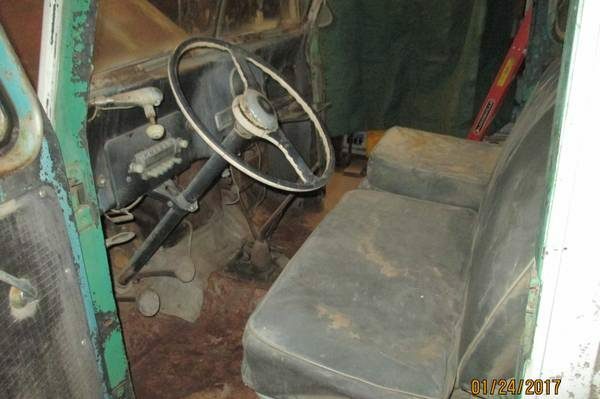 I found a ’51 pickup for sale with a bad 6 cylinder, and put everything from the wagon into the pickup. It still had all the negatives of the wagon, but at least it was a pickup. Like all 4×4’s in the midwest, these are non-existent. Better grab this fast. You didnt like the awesome performance of the Ross steering box!?! Hi Todd, I don’t ever remember a Willys steering wheel that was centered. I think 2 ropes would be better. Love these Willys. There is a great online community at http://www.OldWillysForum.com. This one is mostly intact might be a good buy for the right buyer (duh). The wagons and especially the trucks are built for commercial use. that radiator looks too close to the fire wall to fit ANY motor in there, looks like they did tho. I love everything Jeep, and I like this. I’d restore this just the way it was found. These Jeeps are definitely not daily drivers, but would be fun for a weekend off road trip to hunting or fishing camp. The flat head is a rare and interesting feature, and definitely an upgrade from the OEM 4 banger. I don’t think it would have much impact on the ultimate value of this car. Nice find. I don’t think the flathead is correct, as Willys began the changeover to the hurricane 4 in 1950. Looks like a nice project though.